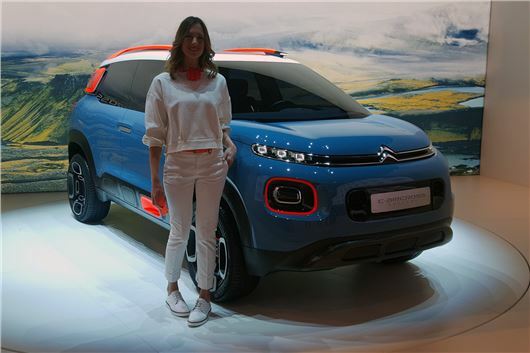 Citroen has premiered the C3 Aircross Concept at the 2017 Geneva Motor Show, which previews the upcoming C3 Picasso model - only this time it’s less MPV and more SUV. Fashionable. The production car will be on sale by the end of 2017, with prices from approximately £16,500. There’s plenty going on with the concept that won’t make production, like the microscopic door mirrors, fancy alloy wheels and textured rubber body-cladding – but in terms of overall appearance, this is the new Picasso. The concept has Grip Control – a front-wheel drive system that provides some extra traction on loose or slippery surface via clever electronics – which will make production too. Engine details are to be confirmed, but 1.2-litre PureTech petrols and 1.6-litre BlueHDI diesels are the likely candidates, which in the C3 have power outputs from 68PS to 110PS. C3 technology will make it into the C3 Picasso too – so there’ll be a built-in dash camera and a touchscreen with Apple CarPlay and MirrorLink smartphone support. And, typically for Citroen models of late, there’ll be a whole host of customisation options for things like the exterior Airbumps and interior dashboard inlays, so there'll be plenty to keep you busy in the online configurator.